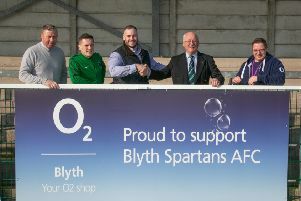 Blyth AFC moved back top of Northern League Division Two after a 2-0 victory over Alnwick Town at Woodhorn Lane, writes Andrew McDonnell. After a goalless first-half, the Braves eventually broke the deadlock on 64 minutes, with captain David Robinson firing low into the bottom corner. Michael Chilton was brought down in the penalty area in additional time and the striker stepped up and slotted home to wrap up the victory. It was the hosts who had the first opening of the game on 10 minutes as the ball broke in front of Fenton, who then struck straight at keeper Robert Hodgson. The sides exchanged chances thereafter, with Adam Harvey lashing over the bar before Ryan Douglas fired off target for Alnwick. The closest either team come in the first half was on 24 minutes as Robinson floated a cross to the back post before Chilton headed back across goal and inches wide. Blyth had a big appeal for a penalty waved away four minutes later when it appeared that Fenton was pushed down in the area, but the referee waved away the appeals. Going into the second-half, the hosts knew they needed to increase their tempo, however, it was the visitors that come close to breaking the deadlock on 58 minutes. Kevin Westphal played the ball into the area to Ross Straughan, who swept at goal first time, but he was denied by a sublime save from Chris Bannon. The game sprung to life from there with Chilton having an effort cleared off the line on 61 minutes before substitute Liam Hudson broke through on goal and was denied by Hodgson. Alnwick broke quickly to the other end and Josh Hay fired off target, however, the Braves were clinical with their next attack as they opened the scoring. The ball was worked to Robinson on the edge of the area and the skipper, fresh from signing his contract, fired home clinically into the bottom corner. Alnwick battled valiantly throughout, but Chilton was brought down in the area in i njury time, and he stepped up to take the penalty himself, which he slotted into the corner.